Имате въпрос към Sea Bay B & B? Независимо дали сте турист или пътувате по бизнес, Sea Bay B & B е перфектен избор за настаняване в Тайтун. Този 2-звезден хотел е леснодостъпен, тъй като е само на 12 km от летището. С удобното си местоположение хотелът предлага лесен достъп до всички градски забележителности, които задължително трябва да се видят. Предлагайки висококачествени услуги и широка гама от удобства, Sea Bay B & B Ви осигурява възможно най-комфортния престой. Гостите на хотела могат да ползват съоръжения като паркинг, екскурзии. Атмосферата на Sea Bay B & B се усеща във всяка стая. Удобства като телевизор с плосък екран, шкафче с ключ, хавлии, достъп до интернет (безжичен), безжичен интернет достъп (безплатен) са само някои от даденостите на обекта. Освен това в хотела можете да се възползвате от множество предложения за приятно прекарване на свободното време. Когато търсите удобно и комфортно място за настаняване в Тайтун, изберете Sea Bay B & B, който ще се превърне във втория Ви дом. Pros : sea view right in front of the room Cons: hard to get a cab in this area, there was a huge cockroach in our room and ants at the basin. Quiet, near the sea, staff is helpful. This bed and breakfast is outside Taitung, but easy to get to. Not too much in the local village, but easy to get to Taitung by car. Our room was a good size, with a large balcony. The view was perfect, and ideal for watching the sun rise (check the sun rise times in the foyer). Room had a good bathroom with powerful shower and large bath (also with sea view!). Although relatively basic amenities, it had everything you would expect from a b&b. Breakfast was a sandwich and drink, which we preordered when we arrived, and was delivered to our room. There is a military base just behind the hotel, so we had fighter jets flying overhead from around 8am. We would definitely stay here again. Satisfactory stay but no lift! Have washing machine and delivery of breadfast to room . Remember check in time is 3 pm and nobody there if earlier than this time. Staff is sincere and helpful! From the street, this place doesn't look impressive but the spacious, comfortable rooms paint a different picture. We stayed in ocean view rooms that were immaculately clean with a balcony big enough for four adults to sit and look at the sea. The bath tub is big enough for two and there's a shower too. 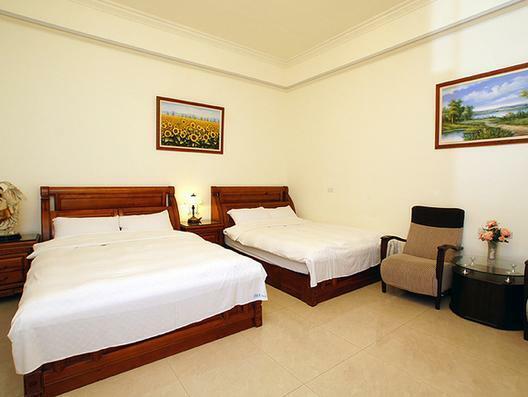 These rooms have two comfortable doubles beds and a coffee table with chairs. We could have happily stayed more than one night in Taitung for these rooms alone. The staff were very helpful and gave us a menu to choose what we wanted for breakfast. This was delivered to our rooms for us to enjoy on the balcony :) Thank you Sea Bay. This room was very clean and quiet with only the surf and fresh ocean breeze to lull us to sleep. The owner was very helpful purchasing tickets for us to take the ferry and even escorting us there. We had a wonderful sleep listening to the surf. The owner was very hospitable and held our reservation for two rooms even though another lady was there trying to take it when we arrived. He also bought our ferry tickets for us and escorted us to the terminal. The room was large and clean and had a lovely large shower and soaker tub overlooking the ocean. Also the large balcony was nice to enjoy breakfast in the morning. Our family enjoyed using the ocean walk just out the back of the B&B. Great location, right on the seafront. Able to leave wiindows open at night to listen to the sea. Great double bath with sea view. Have never had a better sea view, I could have thrown a stone into it from our balcony. Close to a small fishing port and backing onto a military airfield, there was plenty to see. Breakfast was minimal, a ham or tuna burger delivered to the door, but the rooms was clean, modern and spacious. We spent the evening sitting on the balcony watching the sea, and the nights listening to it. Kan er niets slechts over bedenken. Ver van het stadscentrum, maar de bushalte is voor de deur, en de eigenaar regelt vervoer naar het station als je daarom vraagt. Het is wel handig als je Chinees spreekt, ,want ik betwijfel ernstig of hij engels spreekt.